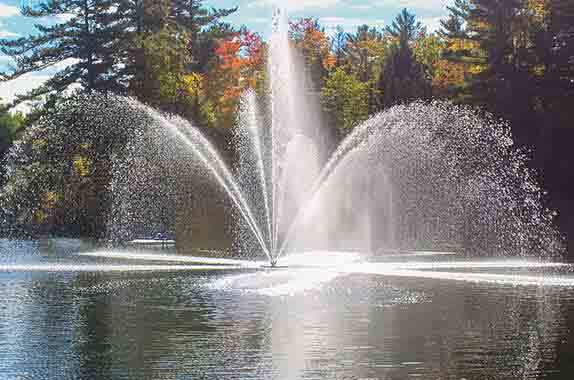 How to Ensure an Easy Installation for Your Large Lake Fountains? We are always looking at innovative ways to ensure ease of installation for our lake fountain customers. In order to ensure the ease of your Fountains installation we designed a wheeled installation system that is an option on our 2 to 10 horsepower fountains. This makes installing your fountain simpler and it will save you time. Very little assembly is required. Run power cable to exit at bottom center of frame. Fasten and protect as necessary. Fasten intake screen on the end of flow sleeve with 3 fasteners and washers. You are ready to launch your fountain in the water. Moor fountain with ropes to shore or anchors and run power cable to shore. You’re Done… Time to Enjoy the View! How Much Does a Floating Lake Fountain Cost?